Parma Number 34: Queens Arms Hotel … No salad = enough said! The Verdict: I had received a pretty good recommendation for the chicken parmigiana at the Queens Arms Hotel. Unfortunately, it failed to live up to the hype! The fact that there was no salad in this dish was not a good start that this meal never really recovered from! Chicken piece: The chicken piece on that QA Hotel parma was a large piece that was well crumbed and had been well cooked. This element of the dish was the hero by a fair distance. Tomato Sauce: A lack of full coverage of the chicken piece was the only real negative about the tomato sauce. There was a quite thin spreading of the sauce across the chicken piece when coupled with the fact that it did not cover the chicken piece in full was quite disappointing given how good the sauce tasted. Ham: There just was not enough of the ham on this dish. It was shredded ham as well as being a little tasteless. To be honest, taste wise, it was like there was no ham at all on the chicken piece. Cheese: The cheese in this dish was excellent. It was welt melted and tasted great. Again, the lack of coverage on chicken piece was an issue. Chips: The chips had the look of very nice chips and some of them were very nice: well cooked, crispy and well salted. Unfortunately some of the chips were very under cooked and cold. Salad: There was not any salad. Enough said. Presentation: The meal was presented on a largish board with the chips and chicken piece well separated. Indeed there was plenty of room for the salad which was missing. Venue: The Queens Arms hotel is located in James Street in New Farm. It is another of Brisbane’s many hotels that has a long history which has been revamped in recent years. My chicken parma was on the expensive side $23. The Final Word: The lack of salad on this dish was a bad start but it also got enough elements wrong to put this chicken parmigiana in the bottom half of the parma ladder. 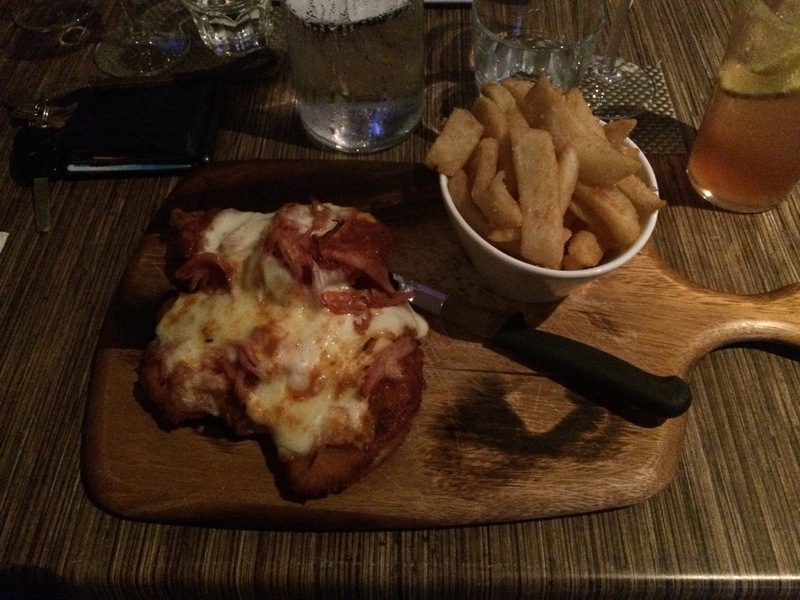 This entry was posted in Uncategorized and tagged Brisbane, brisbane's best parma, chicken, chicken parmigiana, queens arms hotel. Bookmark the permalink.